“…a night of sleeping with your face planted in your pillow could lead to permanent wrinkling. Imagine if the unsightly lines you wake up with were etched permanently into your face. The American Academy of Dermatology warns against side and stomach sleeping, instead recommending you try and sleep on your back.” – Huffington Post 50 Article: Everything You Know About Wrinkles Is Wrong. But what still doesn’t seem to be common knowledge is that a) deciding to sleep on your back isn’t easy if you aren’t already a back sleeper, and b) just because you are sleeping on your back doesn’t mean that you aren’t still giving yourself wrinkles while you sleep. This is very frustrating for many people who quickly find out they can’t just buy a “back sleeping” pillow and acclimate to back sleeping easily. It also sort of drives me crazy when I see the many side and back-sleeping “beauty pillows” that boast being anti-wrinkle and anti-aging when their foam mold or flimsy design means you are still having pressure hit some part of your facial skin while you sleep. 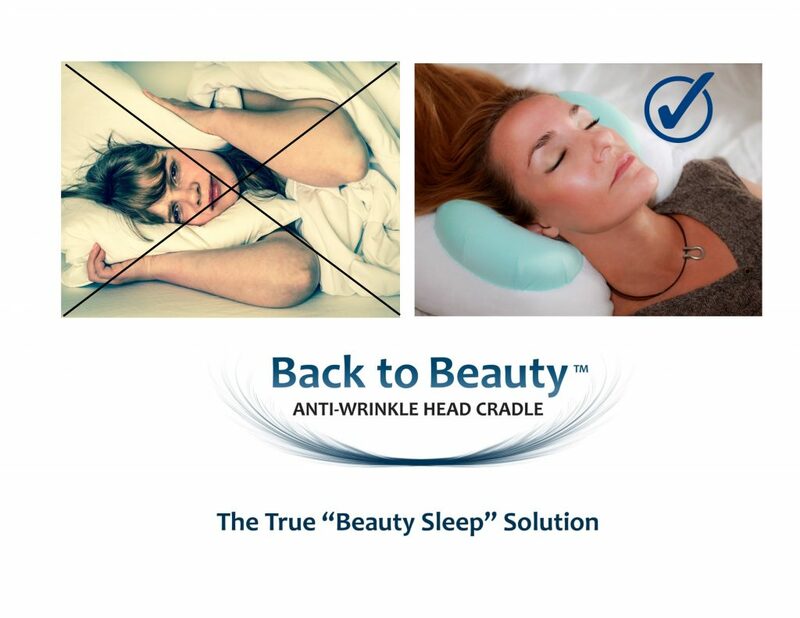 That is why I went to great lengths to design the Back to Beauty Anti-Wrinkle Head Cradle beauty pillow to address the many discomforts of back sleeping while focusing on total sleep-wrinkle prevention. Back to Beauty isn’t just another back sleeping or anti-aging beauty pillow – it’s a truly unique and versatile form-fitting head cradle that prevents the head from falling side-to-side to keep delicate facial skin from being touched and damaged during sleep. This means you can say goodbye to the woes of morning bed head and pillow face. Your hair won’t get flattened during sleep and anti-wrinkle/acne-preventing lotions as well as facial injections and cosmetic surgeries will be left undisturbed, allowing them to do their job. Because of this, Back to Beauty is truly face-saving. I also understand and respect that everyone is different. Back to Beauty’s patented design, with compact-cradle size, and fluffy hypoallergenic down-alternative fiber, was created specifically to enable use in various positions – allowing you to find your personal comfort zone. Back to Beauty is foam free, and won’t compress to get hard and hot like back-sleeping foam mold pillows can, and retains a full and luxurious feel that supports the neck and stabilizes the head to provide true beauty sleep. If you are considering getting the Back to Beauty Anti-Wrinkle Head Cradle please watch my tutorial to see if back sleeping is right for you. I also provide critical help with back sleeping training tips, breaking in the pillow, finding your personal comfort zone, and ensuring you get the most wrinkle-preventing beauty sleep! Thank you!